Whitewood is a city in Lawrence County, South Dakota, United States. The population was 927 at the 2010 census. Whitewood was platted in 1888 when the Chicago and North Western Railway was extended to that point. It took its name from nearby Whitewood Creek. According to the United States Census Bureau, the city has a total area of 0.64 square miles (1.66 km2), all of it land. Whitewood has been assigned the ZIP code 57793 and the FIPS place code 71580. As of the census of 2010, there were 927 people, 374 households, and 232 families residing in the city. The population density was 1,448.4 inhabitants per square mile (559.2/km2). There were 392 housing units at an average density of 612.5 per square mile (236.5/km2). The racial makeup of the city was 91.9% White, 0.8% African American, 3.7% Native American, 0.1% Asian, 0.3% from other races, and 3.2% from two or more races. Hispanic or Latino of any race were 2.5% of the population. There were 374 households of which 33.4% had children under the age of 18 living with them, 46.8% were married couples living together, 8.3% had a female householder with no husband present, 7.0% had a male householder with no wife present, and 38.0% were non-families. 30.7% of all households were made up of individuals and 12.3% had someone living alone who was 65 years of age or older. The average household size was 2.44 and the average family size was 3.05. The median age in the city was 38.8 years. 26.9% of residents were under the age of 18; 6.5% were between the ages of 18 and 24; 23.7% were from 25 to 44; 28.8% were from 45 to 64; and 14.1% were 65 years of age or older. The gender makeup of the city was 50.6% male and 49.4% female. As of the census of 2000, there were 844 people, 330 households, and 224 families residing in the city. The population density was 1,303.6 people per square mile (501.3/km²). There were 356 housing units at an average density of 549.9 per square mile (211.5/km²). The racial makeup of the city was 95.62% White, 2.61% Native American, 0.24% from other races, and 1.54% from two or more races. Hispanic or Latino of any race were 2.13% of the population. There were 330 households out of which 35.8% had children under the age of 18 living with them, 53.9% were married couples living together, 10.6% had a female householder with no husband present, and 32.1% were non-families. 26.1% of all households were made up of individuals and 11.5% had someone living alone who was 65 years of age or older. The average household size was 2.52 and the average family size was 3.00. In the city, the population was spread out with 27.4% under the age of 18, 8.6% from 18 to 24, 29.7% from 25 to 44, 19.7% from 45 to 64, and 14.6% who were 65 years of age or older. The median age was 36 years. For every 100 females, there were 101.4 males. For every 100 females age 18 and over, there were 92.8 males. The median income for a household in the city was $29,297, and the median income for a family was $30,859. Males had a median income of $25,347 versus $16,597 for females. The per capita income for the city was $12,247. About 15.6% of families and 17.8% of the population were below the poverty line, including 24.5% of those under age 18 and 7.2% of those age 65 or over. 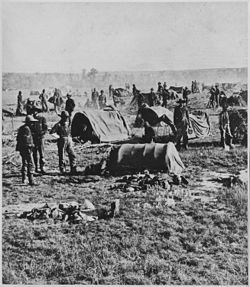 "General Crook's headquarters in the field at Whitewood (Dak. Terr.). On starvation march 1876." ^ a b "US Gazetteer files 2010". United States Census Bureau. Retrieved 2012-06-21. ^ a b "Population Estimates". United States Census Bureau. Retrieved June 8, 2016. ^ Hellmann, Paul T. (May 13, 2013). Historical Gazetteer of the United States. Routledge. p. 1001. ISBN 1135948593. Retrieved 30 November 2013. ^ Chicago and North Western Railway Company (1908). A History of the Origin of the Place Names Connected with the Chicago & North Western and Chicago, St. Paul, Minneapolis & Omaha Railways. p. 138. ^ United States Census Bureau. "Census of Population and Housing". Retrieved October 4, 2014. This page was last edited on 12 May 2018, at 01:15 (UTC).